A new study from the American Heart Association shows that regular meditation was correlated with a 48% reduced rate of death, heart attack and stroke. Blood pressure was reduced and anger decreased significantly among the meditation group. They also showed a trend towards reduced smoking. "It appears that Transcendental Meditation is a technique that turns on the body’s own pharmacy – to repair and maintain itself." said lead researcher Dr Robert Schneider, director of the Institute for Natural Medicine and Prevention in Iowa. Dr Schneider added: "Transcendental Meditation may reduce heart disease risks for both healthy people and those with diagnosed heart conditions." "The research on Transcendental Meditation and cardiovascular disease is established well enough that doctors may safely and routinely prescribe stress reduction for their patients with this easy to implement, standardised and practical programme." The study was funded by the US National Heart, Lung and Blood Institute. 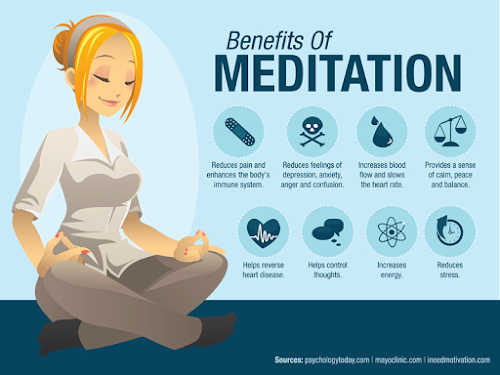 Studies on the effects of mediation have been done countless times, but this is by far the most prestigious and recognized study to date, proving that simply meditating 20 minutes twice a day can cut your chances of sudden death, heart attack, and stroke in half immediately. But while the magnitude of those results is remarkable, the study involved a relatively small number of participants, and did not reveal how meditation may be lowering heart disease risk. On the surface, it's intuitively obvious that stress management can affect heart health for the better; anxiety and stress cause blood pressure to shoot up and leave us on edge, triggering spikes in heart-harming stress hormones like cortisol.